MDS: The moon is 99% cheese. Obviously then NASA landed on the rocky parts of the moon and completely missed the cheese. But still, the moon landings were faked, everyone knows that. And according to whale.to, not only did NASA fake the moon landings, they hide NAZI UFO’s. SR: The moon is not made of cheese. Years of scientific evidence and observation support this. 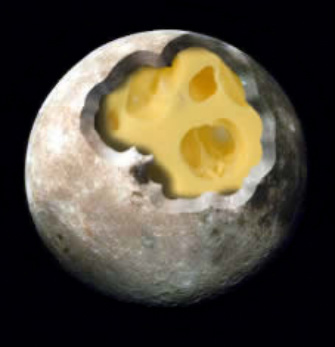 A cheese moon would be destroyed by meteorites and gravitational forces. We could detect the organic compounds of cheese. MDS: The moon IS made of cheese. It’s very strong cheese. Or it keeps getting replaced by the moon-cheese factory. Big Astronomy doesn’t want you to know it is cheese because it would affect sales of telescopes. What if Big Astronomy just hangs up a cardboard cutout of the moon whenever it gets destroyed? Therefore the moon is made of cheese. SR: The moon is not made of cheese, there is no proof that Big Astronomy exists and it is irrational to expect so many scientists would lie for so long. Neil deGrasse Tyson, so far, has not posted one single thing on his Facebook account about the moon being cheese. MDS: The moon IS made of cheese. Big Milk is keeping the truth from the people so we won’t mine the moon for cheese. SR: The moon is not made of cheese, it is not economical to mine the moon and transport anything, cheese or not, from the earth to the moon. Plus, this contradicts your assertion that the beliefs about a rocky moon are maintained by Big Astronomy, which you haven’t actually supported in any way. So is there a conspiracy between Big Astronomy and Big Milk to hide the truth? MDS: ZOMG!!!! You get it. SR: Sigh. I forget you guys are blind to sarcasm and irony. MDS: THE MOON IS MADE OF CHEESE!!!!!!! SHUT UP!! I’M GLAD I WON THIS ARGUMENT!!!!! YOUR JUST MAD I WON. MDS: Grammar Nazi!!!!!!!!!!! The surface of the moon may, perhaps have rocky elements to it. But underneath the crust, it is solid cheese. SR: The moon is not made of cheese. In case you don’t know, cheese is made up of fat, protein, water and gas, while rocks are made of, well, rock which is much denser. A cheese moon would not exert as much gravitational pull on the earth, and we would be able to tell the difference between a cheese-core moon and a rock-core moon through the influence on the tides. This is science. MDS: …(erases discussion) I like pie. Therefore I win. SR: Sigh. Moron. 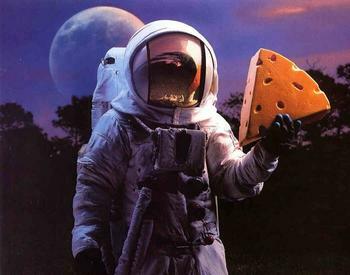 There are no plausible mechanisms that would allow the moon to make cheese. None at all. MDS: And just because YOU don’t know how the cheese is created on the moon, doesn’t mean that there isn’t a cheese creating mechanism at the core of the moon. Run by secret moon wizards. And there are moon cows, that only live on the far side of the moon, eating moon grass that grows during the 14.25 days of the month where it’s illuminated – presumably spending the remaining 14.25 days in hibernation or possibly storing metabolite like cacti. Naturally, since the crust is mostly rock, then the grass would be mostly rock too, leading to heavier milk and cheese. There’s your Occam’s Razor! All you need to do is assume the existence of a completely novel form of biological life and the explanation becomes simple! Even more so when this neatly explains the motivation for Big Milk – moon cheese is much more valuable than “earther cheese” and only the superwealthy can afford the biological processing necessary to make it edible instead of poisonous which is why only the super-rich members of the Illuminati and Freemasons know about it. NOW IT ALL MAKES SENSE!!!!! SR: Seriously. You’re an ignorant moron. Sigh. I’ve adapted this conversation from a sarcastic rant someone sent to me years ago, written after some long frustrating arguments with trolls who use ad hominem based Big Pharma/Agra/Moon Landing/Round Earth Shill Gambits. I don’t remember the name of the author (my filing system pre-Evernote was pathetic), so whoever you are, thanks. Drop me an email through the Contact Me page, and I’ll give you due credit.